Over the course of being in business here we have discovered a lot about the city of Olvera and the surrounding towns that we would like to share. Come and experience the lifestyle – it is affordable and fun and most families find their children are well looked after by one and all. Olvera is a “pueblo blanco” situated in the most north-easterly corner of the Cadiz province in the heart of Andalucía in the south of Spain. Within a few kilometers of the town center there are the county boundaries of Seville to the north and Malaga to the east. Olvera stands just beyond the enormous Guadalquivir valley, nestling in the Sierras of Lijar, Tablón, Molina and las Cumbres which create stunning vistas in almost any direction. The most outstanding feature of the town is the 12th. century castle crowning the hilltop while within the castle walls is a cathedral and a large open square. 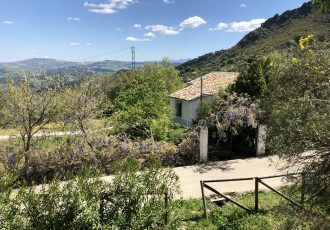 The “casco antigüo “, La Villa Vieja is arranged around the church with typically narrow Moorish streets and stairways which often present views of the surrounding countryside that are breathtaking. Pruna is a smaller town than Olvera, nestled at the base of the mountain pass, with a watchtower fort signaling its ancient heritage as part of the chain of frontier towns. Pruna, like Olvera its focused upon the Olives in the area, with two well known factories, and in December the air is heavily scented with olive oil. 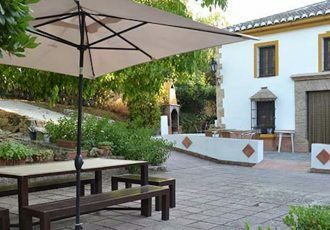 Torre-Alháquime is five minutes south-east of Olvera, with an easy-going feel, this village is ideal for anyone looking for a quiet retreat. Further down the same road is Setenil de las Bodegas, famous for its cave houses and cool cellars. El Gastor cannot avoid being called quaint. 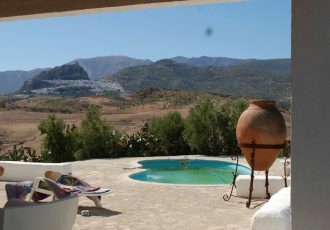 Visible from Olvera, to the south-west, the pueblo is folded into the mountains and the local inhabitants keep it immaculately, as isZahara de la Sierra, a mountain top town like Olvera, that looks down over the spectacular blue of the Zahara lake. From Olvera it takes about twenty minutes to be at a lakeside beach, ready for a picnic and with a rod and line your barbeque could include freshly caught fish to be eaten after canoeing across the water. Just off the main road to Arcos, fifteen minutes west, is the pretty town ofAlgodonales. The plants in this area often look greener in summer because of the abundance of water in the substrata. Then later in the year, as the houses face south into the valley, taking advantage of all the winter sun, the town almost always is surrounded by flowers. These then are the towns immediately around Olvera – each and every one is worth while visiting,exploring and revisiting. The Via Verde is a length of old railroad that was never completed as a train track from Olvera to Arcos; instead it now a nature trail and arguably the most famous of the via verdes in Andalucia. The 39 km. of flat, surfaced, track goes through some of the most beautiful countryside in Cadiz province, tunneling through mountains and bridging rivers, in a setting of tranquility away from cars. 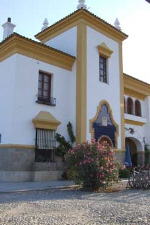 The start of this journey is at the base of the town of Olvera, where there is a hostel with an excellent restaurant that has an extensive menu, and it continues westwards, into the sierras, past a string of old station houses, some of which are converted into inns – others are waiting to be renovated. TheVia Verde is a treasure and a delight for cyclists, ramblers and horse riders. Bikes can be rented out for a very reasonable amount at an hourly or half daily rate from the hotel bar. The Lake (Embalse) at Zahra de la Sierra, is some 20 km. South-West of Olvera and has many landing stages around it, from which one can picnic, swim, canoe and sail. Nearby at La Muela, above the pueblo blanco of Algodonales, one can also para glide and microlite – the leisure industry in this region is just beginning and there is an infrastructure able to cope with the growth that the area is going to experience.